‘Love loves difficult things’ claims the hoopoe bird at the centre of this poem. And this picturebook could certainly be described as ‘difficult’, for it is mysterious and enigmatic, intriguing and spiritual, writes Clare Walters. 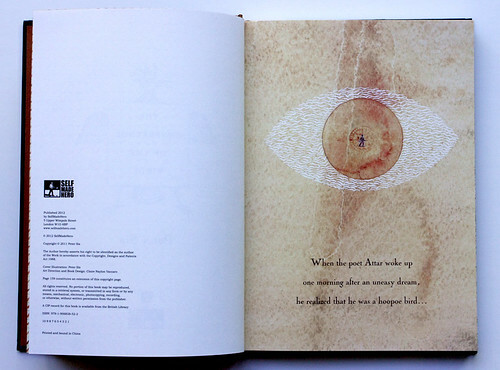 The Conference of the Birds, by Czech artist Peter Sís, is a retelling of a renowned, twelfth-century epic poem in contemporary graphic form. 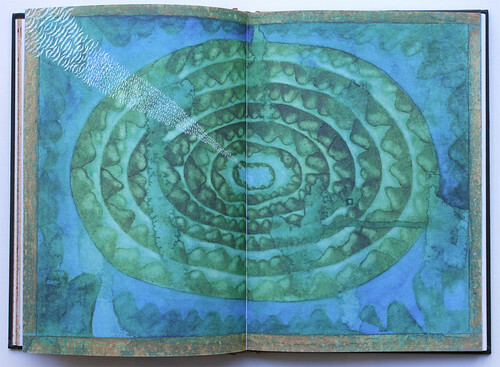 And although the 4500-line original, by Persian poet Farid Ud-Din Attar, is separated from this new version by nearly nine centuries, Sís bridges the gap by distilling the essence of the poem into poetic text and stunning images. 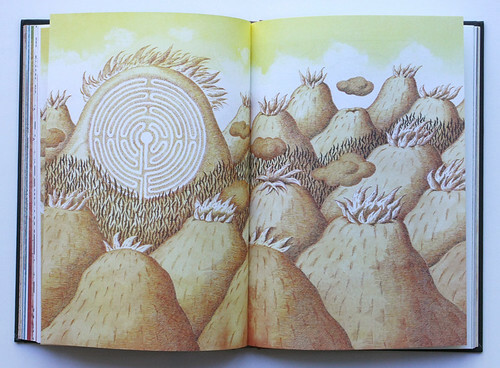 Brno-born Sís, now based in the United States, is known for picturebooks that explore complex themes, such as The Wall: Growing Up Behind the Iron Curtain (2007) and The Three Golden Keys (2001). He has also worked as a filmmaker, animator and illustrator. 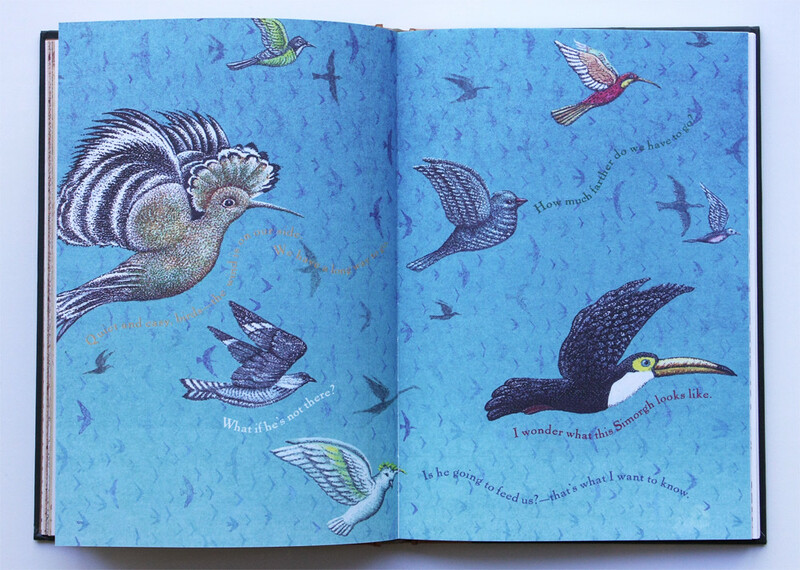 Sís writes: ‘For as long as I can remember, I have loved to draw pictures of flying – freedom – and birds.’ And this book is packed with beautiful images of birds of every description, including doves, parrots, peacocks, toucans, swans, falcons, vultures and nightingales. 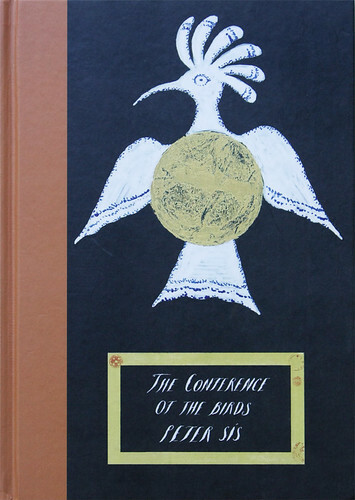 Cover of The Conference of the Birds by Peter Sís: the poet as hoopoe bird. 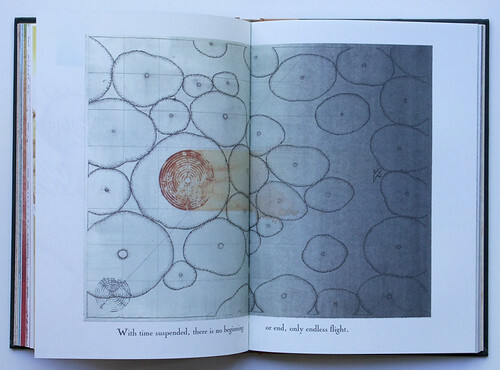 Top: Spread depicts individual birds within the flock. Only by working as a unit can the birds achieve their goal, yet many are focused on personal reservations and doubts. 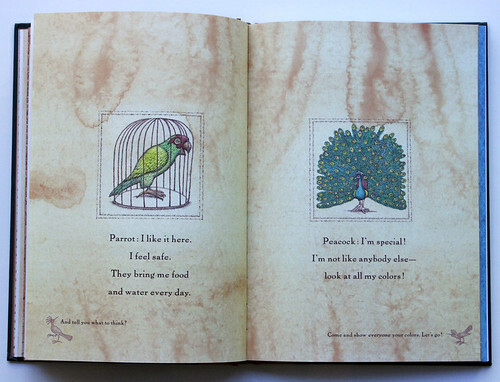 To emphasise their separateness, Sís initially shows individual birds in bordered squares, implying a sense of enclosure and self-imposed restrictions. Double borders reinforce the birds’ isolation. The hoopoe wins the argument and the birds lift into the air as a single flock. The fluidity of their movement is reinforced by the splotchy watercolour background washes of tawny yellows, fertile greens and aqua blues, over which the changing landscapes – deserts, oceans, forests and mountains – are laid. And also by the circles, spirals and mazes that now predominate, suggesting the movement and freedom of which Sís speaks. United now, the arrow-like flock appears a single entity. Seven valleys of challenges lie ahead – Quest, Love, Understanding, Detachment, Unity, Amazement and Death – and many birds fall by the wayside. Only 30 survive all seven challenges, and these lucky few discover that the answer to the world’s problems comes from within themselves. This paradox is central to a text packed with paradoxes. Vast oceans are ‘drops of rain’ and endless deserts ‘crystals of sand’. Sís emphasises such contradictions through his varied use of viewpoint and contrasting scale. A side-on view of a fiery mountain range on one page morphs into an aerial view on the next, where the mountaintops now eerily echo microscopic images of amoeba-like cells. … mutates into cell-like structures. Strange symbols, seals and stamps – seen first as small marks – are later shown as part of vast landscapes. The opening image says it all. A human eye is made up of a flock of birds, its pupil containing a man. Yes, we are all individuals, the poem seems to suggest, but it is only by coming together that we can really see. A message as relevant today as in the twelfth century AD. Opening lines of the poem: one eye or many birds? The Conference of the Birds is part of Self Made Hero’s ‘Eye Classics’ series of literary adaptations. Clare Walters, author of children’s picturebooks and journalist, London.